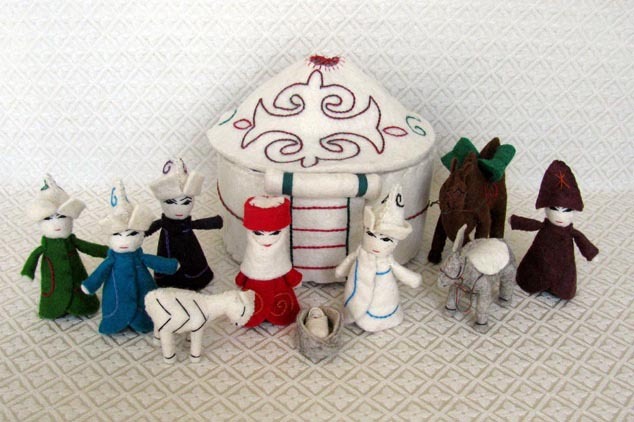 This Nativity is handcrafted from wool felt by Aigul in Bishkek, Kyrgyzstan. The traditional figures are joined by a decorated yurt—the traditional felt dwelling of Central Asian nomadic peoples. The wise men wear bright clothing with matching hats. The Joseph figure measures 4.5 inches to the top of his kolpokhat. The yurt measures 7.5 inches tall and 7.5 inches in diameter. $80. Please click here for purchasing instructions. Special order.